Dash cameras - small, relatively affordable cameras that live in the windscreen and record the road ahead - are becoming increasingly popular with all kinds of motorists, from professional HGV drivers down to newly-qualified drivers looking to protect their insurance premiums. There's a lot of mumbo-jumbo to navigate through when picking a dash camera though - and a lot of cameras to choose from. But don't worry, we can talk you through the jargon so you can figure out which dash cam is best for you. 480P – Also called standard definition or VGA. Most cameras give users the option to film in VGA, but the quality isn’t very good. VGA footage takes up less space on a memory card than higher resolutions, though. 720P – Also called HD resolution. 720P offers a good blend of file size, image quality and frame rate for most dash camera users. Some cheaper cameras won’t record at resolutions any higher than 720P. Most cameras give users the option of which frame rate to record in while set to 720P, usually up to a high 60fps for very smooth footage. 1080P – Also called Full HD resolution. This is often the highest resolution dash cameras record in, though more recent ameras will record in 4K. Most older or cheaper dash cameras won’t record 1080P video at any more than 30 frames per second, but recently 1080p at 60 frames per second is becoming the norm. 4k - Ultra high definition. Some cameras record in extremely high resolutions, though usually at lower frame rates. These give extreme clarity, meaning it's easier to pick out fine details in footage. Unfortunately, file sizes are higher in 4K, so a larger memory card is needed. Auto on/off – This function allows a dash camera to turn on when the car ignition is on. It will then deactivate when the ignition is turned off. This functionality relies on a 12v or USB socket that is linked to the ignition, so it won’t work in cars with permanently active 12v/USB sockets or, indeed, cars with no 12v/USB socket at all. That said, a camera can be hardwired into the car instead. Compression – Dash cameras ‘shrink’ footage so it fits on the memory card. The level of compression is determined by the resolution and frame rate, along with the method employed by the camera designer. More compressed files tend to be less clear, but occupy less space on a memory card. Some cameras allow users to tinker with compression, but for most it is best left in its default state. FPS – Stands for frames per second. This is the number of still images the camera captures every second to create a moving picture. Higher FPS means smoother video but larger video files on the memory card. Users can usually configure the frame rate of a dash camera to suit their needs. For most users 60fps in 720P resolution offers the ideal balance between quality, smoothness and file size. Full-HD – Another name for 1080P resolution. G sensor – A built in sensor that detects violent movements, such as impacts, or cornering force. Many dash cameras use G sensors to automatically save footage, just in case the driver forgets or is incapable following an accident. Some cameras allow the user to turn off the G sensor so it isn’t triggered on bumpy roads. GPS – Global Positioning System. This satellite system usually gives drivers directions via their sat nav, but it can also be used with dash cameras to record the location of the vehicle. Along with the footage recorded by the camera, this is useful for proving an accident happened in a specific location. It also proves the speed the vehicle was driving. GPS receivers are fitted to more expensive dash cameras. Hard-wiring - A more permanent wiring solution - the power for the dash camera is linked to the ignition directly, rather than a 12V or USB socket. 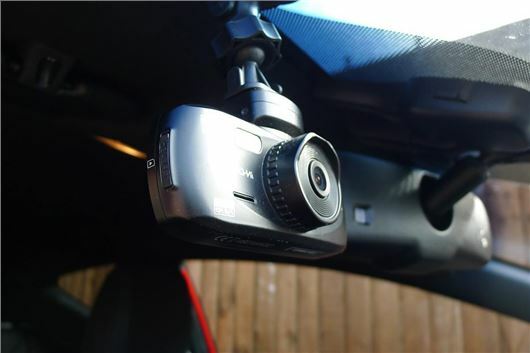 A professional can usually neatly install hard wiring for a dash camera for a fairly low price, and the camera itself can typically still be removed, leaving the wiring in place. HD – Another name for 720P resolution. Loop recording – Instead of recording one large video clip, dash cameras are designed to record shorter clips of around three minutes. Once the memory card is full the camera will then overwrite the oldest clips unless the user has marked them to be saved. This means the camera won't turn off or stop recording at any time - essential in a something designed to capture the unexpected. Memory card – Used to store video files. Some dash cameras have built in video memory, but most require the user to install a memory card, either in the form of an SD, MiniSD or MicroSD card. Check the specification of your camera to be sure you buy the correct type, class and size of card. Generally speaking higher class and size cards cost more - and they are the ones you'll need for a dash camera. MiniSD card - The name given to memory cards of a specific size and shape. Many dash cameras take MiniSD sized cards - check with the manufacturer for the correct class and the maximum memory capacity of your camera. MicroSD card - Smaller than a MiniSD card. This is the most common size of memory card used by dash cameras. Check with the manufacturer for the correct class and the maximum memory capacity of your camera. Motion Detection – Many dash cameras have a setting that allows them to record when movement is detected. This is to capture car park incidents or criminal activity when the car is unoccupied, but it can drain the dash camera battery. Night Vision – Dash cameras are almost all designed to work in low light conditions, however some have better night vision capability than others. Some include infrared bulbs to illuminate the area in front of the car even when the headlights aren’t active. Resolution – Refers to the number of pixels captured by the camera in each frame. Higher resolution images are larger and clearer, but take up more space on the memory card. See also 1080P and 720P. SD Card - Stands for Secure Digital and is the name given to a memory card of a specific physical size and shape. Some dash cameras use standard sized SD cards, but most use similar, but physically smaller MiniSD or MicroSD cards. VGA – Another name for 480P resolution. Viewing Angle – The angle a camera lens is capable of capturing, measured in degrees. Dash cameras tend to have wider viewing angles in order to capture more of what is happening around the car. This typically means footage looks a little distorted, but is less likely to miss things happening off to the sides, such as at junctions.